1. Start by making the tomato sauce. In a large pan on a medium heat, cook the fresh tomato and juices with the bouquet garni for 10-15 minutes until soft and broken down, add the passata and cook for a further 20 minutes until the mixture has thickened and reduced by half, approximately, remove the bouquet garni. Using a hand blender, blitz the mixture until smooth, add the Tabasco and Worcestershire sauce, then season. 2. For the crab filling, place the vegetable stock in a saucepan over a medium heat and allow to come to 50°C. Place the fish in the warmed stock and allow to stand for approximately 15 minutes or until cooked through. Remove the fish from the liquid using a slotted spoon and drain on kitchen paper, reserve this liquid for later use in the sauce. When cooled, flake the fish with a fork and mix with the cooked white crab meat. Place in a covered bowl in the fridge. 3. For the white sauce, heat a thin layer of oil in a saucepan over a medium heat and sweat the shallots, garlic, fennel seeds and bay leaf for 10 minutes. Add the wine, increase the heat to high and allow the liquid to reduce in volume by two thirds. Add the reserved cooking stock from the fish and reduce by half, strain through a fine sieve discarding the shallots, garlic and aromatics. Return the liquid to the pan and add the whipping cream and milk. Place over a medium heat and when the liquid is warm, add the cornflour blended with a little cold water and whisk over the heat until the sauce thickens, approximately 5 minutes. Season with salt, freshly ground white pepper and nutmeg to taste. 4. Assemble the lasagne, preheat the oven to 180°C, gas mark 4. Pour a thin layer of tomato sauce into the base of a square oven proof baking dish, approximately 24cm, followed by a layer of lasagne sheets followed by a thin layer of the tomato sauce, white sauce and half the crab and cod mixture. Sprinkle over some of the freshly chopped herbs and cheese. Place another layer of lasagne sheets on top and repeat the same layers starting with the tomato sauce. Repeat with the remaining ingredients, finishing up with a layer of white sauce and grated Parmigiano Reggiano. 5. 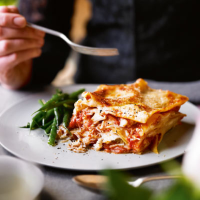 Place the lasagne in the preheated oven for 25 minutes or until the edges begin to bubble, just before serving, sprinkle any leftover herbs on top, if you like.